Wyatt Hunt—hero of John Lescroart’s New York Times bestseller The Hunt Club—returns with a new protégé, in an intricate, tightly plotted thriller set against San Francisco’s glamorous charity circuit. Mickey Dade hates deskwork, but that’s all he’s been doing at Wyatt Hunt’s private investigative service, The Hunt Club. Hunt’s been keeping an eye on Mickey and his sister, Tamara, since their hardscrabble childhood, so Mickey’s pitching in to pay for chef school. His itch to be active is answered when a body is discovered: It’s Dominic Como, one of San Francisco’s most high-profile activists—a charismatic man known as much for his expensive suits as his work on half a dozen nonprofit boards. One “person of interest” in the case is Como’s business associate, Alicia Thorpe—young, gorgeous, and the sister of one of Mickey’s friends. As Mickey and Hunt are pulled into the case, they soon learn that the city’s golden fund-raiser was involved in some highly suspect deals. And the lovely Alicia knows more about this—and more about Como—than she’s letting on. 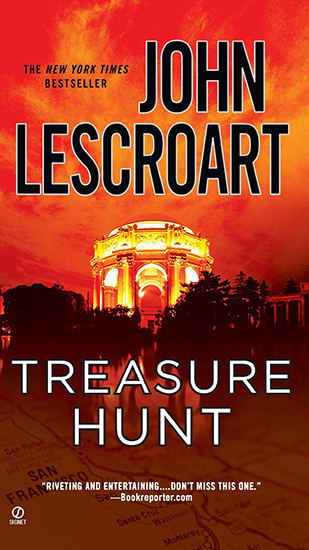 Treasure Hunt is both a nail-biting thriller and a coming-of-age story, filled with Lescroart’s trademark San Francisco flavors. Mickey Dade, its young, fresh protagonist, gradually learns the lessons Hunt knows only too well, as the world he imagines unravels around him.